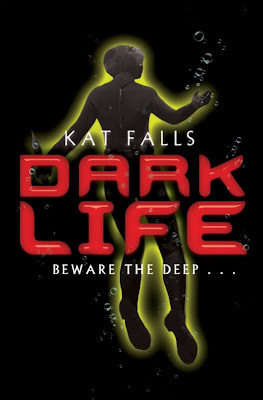 I reviewed DARK LIFE today, and now I'm very pleased to welcome Author Kat Falls to Dystopian February. Hi Kat! So what are some of your favorite dystopian/post-apocalyptic novels, if any? Did they influence you at all in the writing of Dark Life? I love sci-fi, so anything even vaguely dystopian or post-apocalyptic will always catch my attention whether a book or film. I think the first novel I read that falls into the niche was Stephen King’s The Stand, followed by Richard Matheson’s I Am Legend (because in an interview King mentioned that it was his favorite book.) Both kept my imagination buzzing long after I’d finished them. 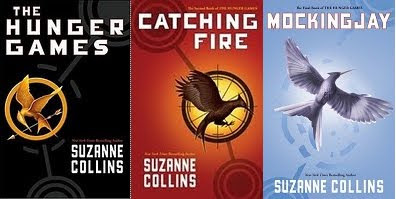 Others that I’ve loved since then: Enders Game, The Handmaiden’s Tale, Feed, The House of the Scorpion, the Uglies series, and of course, The Hunger Games & Catching Fire. They didn't consciously influence me. However, I’ve been an avid fan of dystopian films since childhood – Planet of the Apes, Logan’s Run, Blade Runner, The Road Warrior, 12 Monkeys, 28 Days Later, Children of Men, Sunshine… just to name a few favorites. So I know those images seep into my writing. But the funny thing is I never thought of Dark Life as a dystopia while I was working on it. My conscious influence was the Western. I was trying to capture the courage and vitality of the old west pioneers and the feelings of wonder and fear that they must have experienced, living in the wilderness. One of the recurring themes in Dark Life is that the survival of the group depends on their willingness to accept one another and work together. It’s a theme straight out of Stagecoach. Dark Life is planned as a series. Why did you choose this format over a standalone novel? And what can we expect from the rest of the series? Actually the premise for Dark Life came to me during a writing exercise – as a stand-alone book. I’d set myself the task of combining three things that my son loved to read about into one story – pioneers, the ocean and the X-men. But once I started designing the world, I kept coming up other adventures for my characters. I realized it was going to take more than one book to explore all the fun and freaky things that could happen to subsea pioneers. As in the first book, the maturation of the territory will continue to parallel Ty’s personal growth as both try to achieve some measure of independence. Let’s say climate change does cause the catastrophic conditions described in Dark Life. What would you personally miss the most? Is there anything at all you’d actually like better about that world? Ugh, I’d hate living on the Topside in Dark Life. The loss of the forests and wildlife would devastate me. But, if governments and corporations worldwide were intensely committed to funding the research and development of clean energy alternatives – I’d see that as an improvement over our situation today. Congrats on Dark Life being optioned for film. Have you had any fantasy casting sessions? Who would make an ideal Ty and Gemma? Thanks! Honestly, I haven’t. Though my 10 y.o. daughter would like the producer to put the project on hold until she’s old enough to play Gemma. Why do you think dystopian fiction has such a following these days? What’s the attraction? It does seem to be gathering momentum, doesn’t it? But then, I’ll bet that’s true of speculative fiction across the board. Thank you Kat! Find out more about Kat Falls at the publisher's website. Thanks to the UK publisher, I have 2 copies of DARK LIFE to give away to residents of Europe. Just tell me in your comment what most appeals to you about DARK LIFE and you're entered! I'd appreciate it too if you'd tweet a link or post a link in your sidebar, thanks! This contest will remain open for 2 weeks, until March 10th at 11:59 PM CST. Ship Breaker by Paolo Bacigalupi (Little, Brown, May 1, 2010). Set initially in a future shanty town in America's Gulf Coast region, where grounded oil tankers are being dissembled for parts by a rag tag group of workers, we meet Nailer, a teenage boy working the light crew, searching for copper wiring to make quota and live another day. The harsh realities of this life, from his abusive father, to his hand to mouth existence, echo the worst poverty in the present day third world. When an accident leads Nailer to discover an exquisite clipper ship beached during a recent hurricane, and the lone survivor, a beautiful and wealthy girl, Nailer finds himself at a crossroads. Should he strip the ship and live a life of relative wealth, or rescue the girl, Nita, at great risk to himself and hope she'll lead him to a better life. This is a novel that illuminates a world where oil has been replaced by necessity, and where the gap between the haves and have-nots is now an abyss. Yet amidst the shadows of degradation, hope lies ahead. I am super excited about this one, especially after reading this rave review by Ashley at Book Nerding. Restoring Harmony by Joëlle Anthony (Putnam, May 13, 2010). The year is 2041, and Molly McClure was only six when the Collapse of ’31 happened, ending life as the world’s population knew it. When she is forced to leave the comfort of her small B.C. island to travel down to Oregon, Molly discovers how hard the Collapse has been on the rest of the world. What starts out as a quick trip to the U.S. to convince her grandfather to return to Canada and be the island’s doctor, becomes a rescue mission. How much will she have to compromise to succeed in getting back home? 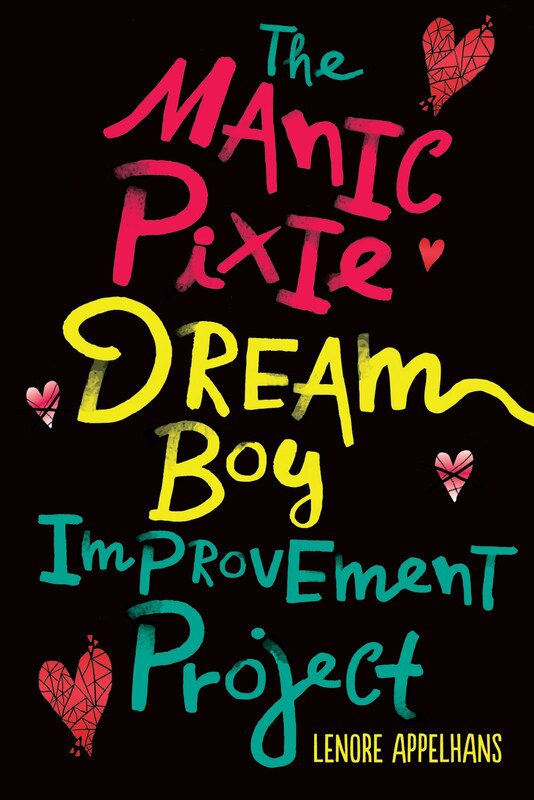 Sounds promising, especially when you read this rave review by Lauren at I Was A Teenage Book Geek. The Gardener by S.A. Bodeen (Feiwel and Friends, May 25, 2010). Mason has never known his father, but longs to. All he has of him is a DVD of a man whose face is never seen, reading a children’s book. One day, on a whim, he plays the DVD for a group of comatose teens at the nursing home where his mother works. One of them, a beautiful girl, responds. Mason learns she is part of a horrible experiment intended to render teenagers into autotrophs—genetically engineered, self-sustaining life-forms who don’t need food or water to survive. And before he knows it, Mason is on the run with the girl, and wanted, dead or alive, by the mysterious mastermind of this gruesome plan, who is simply called the Gardener. Eeeek! Chilling premise! And it has postive reviews on GoodReads so far. For the Win by Cory Doctorow (Tor Teen, May 2010). I couldn't find much info about this one, but it seems to be about virtual gambling. I really enjoyed Doctorow's Little Brother, so looking forward to this one too. Nomansland by Lesley Hauge (Henry Holt, June 22, 2010). Sometime in the future, a lonely, windswept island is populated solely by women. Among these women is a group of teenaged Trackers—expert equestrians and archers—whose job is to protect their shores from the enemy. The enemy, they’ve been told, is men. When these girls come upon a partially buried home from the distant past, they are fascinated by the strange objects—high-heeled shoes, teen magazines, make-up—found there. What are they to make of these mysterious things? And what does it mean for their strict society where friendship is forbidden and rules must be obeyed—at all costs? I like that they find teen magazines and high heels! Empty by Suzanne Weyn (Scholastic Press, Sept. 2010). I couldn't find much info on this one either, but it looks like another story about a world without gasoline. The Unidentified by Rae Mariz (HarperCollins, Oct. 2010). Kid knows her school’s corporate sponsors not-so-secretly monitor her friendships and activities for market research. It’s all a part of the Game; the alternative education system designed to use the addictive kick from video games to encourage academic learning. Everyday, a captive audience of students ages 13-17 enter the nationwide chain store-like Game locations to play. When a group calling themselves the Unidentified simulates a suicide to protest the power structure of their school, Kid’s investigation into their pranks attracts unwanted attention from the sponsors. As Kid finds out she doesn't have rights to her ideas, her privacy, or identity, she and her friends look for a way to revolt in a place where all acts of rebellion are just spun into the next new ad campaign. Rae is a tenner! YAY! And I love books about advertising, so mixed with dystopia, this has to be a winner. Matched by Allyson Condie (Dutton, Nov 30, 2010). So this one is about a 17-year-old falling in love with someone she's not supposed to in a world with arranged marriages. I'm there! The Water Wars by Cameron Stracher (Sourcebooks, Jan. 2011). This seems to be a book about problems caused by the scarcity of water - something very plausible scarily enough. Delirium by Lauren Oliver (HarperTeen, spring 2011). "Love, the deadliest of all deadly things: It kills you both when you have it, and when you don't." 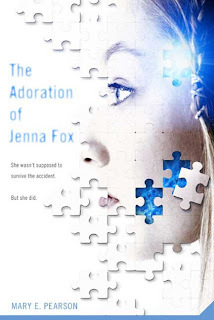 Lena Tiddle is looking forward to having the procedure on her eighteenth birthday that will keep her forever safe from amor deliria nervosa, the world's deadliest disease--commonly known as love. After she is cured, she will be assigned a job, and paired with a boy chosen for her, and she will live happily and peacefully forever, undisturbed by feelings of passion, temptation, or desire. The Unwanteds by Lisa McMann (S&S/Aladdin, fall 2011) This is a dystopian fantasy about a society where strength and intelligence are rewarded in 13 year olds and creativity is punished by death. Alexander Stowe is an unwanted and is “purged” from his community. After watching Lisa read an excerpt at I Heart Monster, I am itching to get my hands on this and find out what happens when Alex gets on the death bus! So these are some of the upcoming dystopian novels I'm most excited about. You can read about even more at this PW article. Are there any I missed that you are super excited about? You know I need to add to my list! Imagine a dystopia where humans have to carry their cat overlords around in bags all the time. And give in to their every whim when they call - whether it is giving them fancy food and treats, playing with them, or lying down in bed to be used as a pillow. 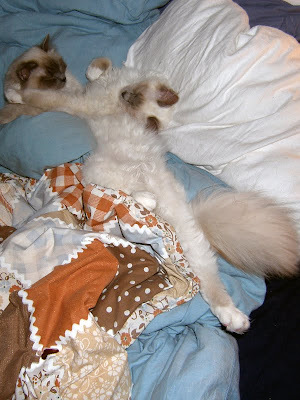 In cat contest news, Emmy and Finn conceeded defeat to Magellen and Penelope in the categories of beautiful baby and cutest cats (though they are secure in the knowledge that they are the cutest cats in the world despite what anyone else thinks). They are, however, in a tie-breaker for cutest couple with none other than....Magellen and Penelope. If you feel the urge the vote in the tie-breaker, vote here. If not, it's ok too. Rachel lives with her mother Vivian on the property of old Mrs. Moore. It lies right next to The Line, an invisible physical barrier that separates the US from the Away – a hastily abandoned part of the country that was subsequently attacked by enemy forces using a banned weapon. Despite their proximity to Away, which is rumored to harbor mutants, Rachel and her mother live a quiet life, trying never to attract attention. Until the day that Rachel finds a recording from the Away asking for help. It’s not often you have three strong female leads in a novel, especially in a work of dystopian fiction. And while the teen character, Rachel, is the main agent in setting up the action of the story, you can take her character at face value – overprotected, naïve, impetuous, and daring. It’s Vivian and stern Mrs. Moore (who I totally imagine as Judi Dench) who provide the secret backgrounds and satisfying twists. The politics and regulations of this new US (Unified States rather than United States – though the change was so subtle, I admit I didn’t even notice it, see interview below) are brutal and show clearly what might happen if an entity like Homeland Security should ever take over and throw out The Bill of Rights. While I definitely appreciated the back story and world building, too much of it happened up front and in the form of exposition which threw off the pacing. What you have now is a slow build in the first half (a less patient reader might snark that the first half is dominated by tons of talk and orchid cultivating in the greenhouse) before the action picks up dramatically in the second half after a chilling visit into town. THE LINE is due out in hardcover March 4th and its sequel (Yes, there’s a pretty evil cliffhanger) THE AWAY is due in 2011. Find out more about the books and read the first chapter of THE LINE at the author's website. And now a warm welcome to author Teri Hall! What are some of your favorite dystopian novels, if any? Did they influence you at all in the writing of THE LINE? The Road by Cormac McCarthy, The Giver by Lois Lowry, Never Let Me Go by Kazuo Ishiguro are three that I love. And while I would not say that they influenced me while I was writing The Line, I would say that they inspired me, and still inspire me. In THE LINE, the US is the only country that isn’t given a made-up name. Is there a particular reason for that? Actually the U.S. is called the Unified States in the book, not the United States. I wanted to suggest the idea that while now we have (or at least think we have) a group of states united together, with certain sovereign rights preserved, to form the U.S., in the world of The Line the states have been unified—they are all under the control of one governing body and there are no individual state rights, nor does the constitution limit the power of the government in any real way over states or individuals. As far as the other country names, they are all based on something about existing countries or how existing countries might change and combine over time to become new countries. Throwing out the Bill of Rights in the name of National Security is something that almost seems plausible given some of the current political rhetoric. Is a world like what exists in THE LINE in our future? I don’t know. But I wanted to ask that question and others (Why do we fear what is different? How can we overcome that fear and learn to embrace what is essential about persons, and ensure that we all enjoy the same rights and freedoms? What exactly do we include in our definition of persons? Can we come up with a better definition?). Encouraging discussion was one of the things I hoped for—I have had some wonderful responses from teachers about using The Line as a discussion tool in class rooms and I think that is exciting. When Rachel surfs her version of the Internet, she reads rumors of sheep-cats and other mutations. What is the strangest thing you’ve ever read on the Internet? Um, wow. Too many things to mention. Why do you think dystopian fiction is so hot right now? What’s the attraction? I really think dystopian fiction never goes out of style. Some people like it because it’s a little frightening, some because it really allows one to escape into another world entirely. There is a fabulous list of dystopias dating from the 1960s to the present, compiled by Dr. Amy H. Sturgis, at http://eldritchhobbit.livejournal.com/262872.html. Great titles that show a long fascination with this genre. I have 3 hardcover copies of THE LINE up for grabs to residents of the US and Canada. Just tell me in your comment one of the strangest things you ever read on the Internet and you're entered! I'd appreciate it too if you'd tweet a link or post a link in your sidebar, thanks! This contest will remain open for 2 weeks, until March 8th at 11:59 PM CST. Elspeth is an orphaned misfit, born with mysterious mental abilities said to have been brought about by The Great White, an apocalyptic event that ended the Beforetime and spared only those in far-flung rural communities. Elspeth must hide these abilities or risk being burned to death (like her parents were) by the fanatic rulers who claim The Great White was meant as Lud’s (God’s) punishment and who seek to destroy anything or anyone different. When she is exiled to the mountain compound for misfits known as Obernewtyn, Elspeth comes against forces that even she, with all her powers, may not be able to escape. I first got really excited about reading this thanks to Rhiannon Hart’s review where she said “It's like the Goldilocks of books: everything is juuuuuuuuuust right.” And come on, how could I resist a book with not only a cat on the cover, but a main character who can converse with cats (as well as all other animals). I’m so envious! For the most part, this 1987 novel lived up to my expectations. The world is described just enough to get you up to speed, but not so much that it suffocates you with unnecessary detail. The plot, with its focus on a group of misfits that can ‘true dream” sometimes seems like it is going to veer off into some mystical mumbo-jumbo, but the denouement is actually quite clever and logical in the framework of the post-apocalyptic landscape. And Elspeth – I just loved her. For all her paranormal gifts, she comes off as remarkably normal and relatable. She’s not shy, but she’s cautious. She’s curious, but not demanding. She may just be the most powerful person on the planet, but she’s humble. The only aspect I found lacking really was the cartoonish way the villains were portrayed, and the two-dimensional quality of some of the supporting players. Madam Vega, in particular, had so much potential, but her character just didn’t go anywhere which was a big disappointment. 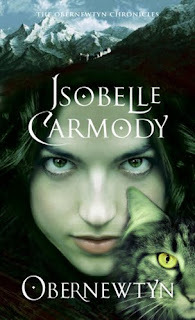 Of course, it is always possible that at least some of these characters will be fleshed out better during the course of the series – after all there are 5 more books already out with 2 more planned for an October 2010 release (pictured). Find out more about them at Obernewtyn.net. The year is 2024 and 15 year old Lauren lives with her family in a walled community in LA County. Outside the walls, chaos rules. A water shortage has driven up prices on everything and people are desperate, stealing and killing just to survive. Even the police would rather steal from you than help you. These terrible conditions make Lauren strong, but can she survive all the trials that are coming her way? Though I thought it got off to a slow start, once I settled into this novel’s rhythms, I was completely sucked in. I found it particularly interesting to see the gradual decline of Lauren’s community over a 3 year period, a stark contrast to a lot of apocalyptic fiction where the world is changed by a sudden event and there is a precisely defined before and after. Of course, even in a world of gradual decline, an individual can still have a defined before and after, and in Lauren’s case, it has to do with the event that forces her out on the road finally to fend for herself which comes about halfway through the narrative. Lauren is a fighter and a survivor, and once she is out on her own, things start to really get interesting. I read this together with Megan of Po(sey) Sessions (we kept track of each other’s progress via twitter) and it wasn’t until this point that the novel really clicked for her. It’s because once Lauren starts her journey, she meets new people outside of her own experience that really broaden her understanding (and ours) of how bad it’s really gotten. Particularly galling is the government sanctioned slave driving that a lot of companies engage in because there are so many desperate people they can take advantage of. But we also meet (or at least see) cannibals, drug addled pyromaniacs, girls forced into prostitution by their own families, and “sharers” – people who share others pain and pleasure because of a drug they were exposed to in utero. Michael Grant's Gone series is a currently ongoing dystopia series that seems to be pretty popular. I've stayed away from it until now, because from the summaries I've read, it just seemed like LORD OF THE FLIES redux. Also, the covers just don't do it for me. I mean how desperate can these kids be if they find time to iron their clothes? So I asked Jen Robinson of Jen Robinson's Book Page to write a guest post about the series for me. You see, not only is Jen a fellow dystopia fan, she's also my book twin. Odds are if she loves a book, I'm going to love it. She also writes amazingly concise yet in-depth reviews that are a joy to read, which makes her one of my top go-to book bloggers when I want reading recommendations. And you know what? I think she may have finally made me excited about picking up this series! 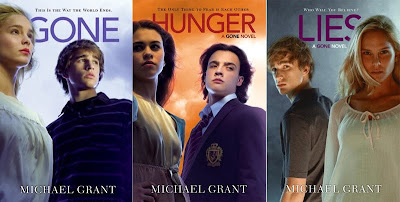 Hunger and Gone are the first two books in a projected six-book series by Michael Grant (book 3, Lies, is scheduled for US publication May 4, 2010). The Gone series features an irresistible premise for dystopia junkies. One day, in the middle of the school day, an impenetrable dome appears around the town of Perdido Beach, CA. (For what it's worth - Gone was published nearly a year and a half before Stephen King's The Dome). The Gone dome has a 20 mile diameter, and also encompasses a nuclear power plant, a snooty boarding school, a national park, and a sweep of ocean. What the dome doesn't encompass is adults. Everyone over the age of 14 vanishes when the dome arrives. Other teens disappear as they reach their 15th birthdays. The kids left in the dome have no idea what's going on in the outside world, or even if the outside world still exists. They're on their own. They name their territory The Fallout Alley Youth Zone, or FAYZ. As if the struggle to survive (finding food, taking care of the younger children) weren't enough, the kids from Perdido Beach soon discover that the boarding school kids are dangerous rivals. Also, some of the kids start to develop unusual abilities (superpowers like invisibility and hyper-speed). These are sometimes helpful, and sometimes harmful, but always make things more complex. As do some developing romances between the main characters. And, oh yes, there's an evil force hidden in the depths of an old mine shaft, that (mostly in Hunger) creeps into the minds and influences the behavior of some of the kids. "This is an irresistible premise and setting. The plot is fast-faced and compelling. The characterization is excellent, too. The kids have talents and insecurities and relationship conflicts. The primary hero, Sam, is a natural-born leader who resists taking charge. He's joined by other strong, interesting characters. Although Gone is a long book, it moves quickly, and I read the whole thing in a single day. Each chapter has, instead of a title, a countdown to how long it will be until Sam turns 15. This device ratchets up the suspense." "So what we have, in summary, is a battle between kids with superpowers and a mysterious evil force, set against a backdrop of social unrest after a natural disaster. 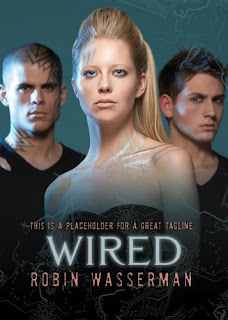 Dystopia fans will find this series hard to resist. Fair warning, though. Hunger is very bleak. In some ways, I found it more bleak than Life As We Knew It and the Dead and the Gone (two of my favorites, by Susan Beth Pfeffer)... But I found the social dynamics of the book fascinating. There's a whole sub-plot centered around Albert, the boy in charge of the food, who is pushing for the re-introduction of money. He feels strongly that the only way to get kids to work is to give them some individual incentive. I found that whole thread well-done, without being at all message-y. I also liked the bits about kids adjusting to a dystopia set in a modern society - they miss Facebook and MySpace, and they want to keep their GameBoys charged, and so on." I was a bit less enthusiastic about the characterization in Hunger (I couldn't quite internalize the struggles of the characters), but thought that the tension and issues were ratcheted up compared to the first book, and that it was a better book overall. I think that the Gone series is an excellent addition to the genre, and will appeal to teen and adult dystopia fans. I think that the books would make great movies (or mini-series). And I'm looking forward to the next book. I am super excited to welcome Jasper Fforde to Dystopian February! 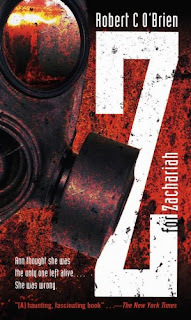 I reviewed the first book in his new dystopian triology earlier this month and gave it a rating of 5 Zombie Chickens - meaning I thought it was the ultimate dystopian reading experience. Not many books get a 5, so that means if you are at all interested in the genre, you want to pick this one up! Let’s say someone loves SHADES OF GREY and wants to read other dystopian works. Which would you recommend? You could do a lot worse than return to primary sources and visit the grandaddies of them all: 1984, Brave New World, Flatland, Fahrenheit 451, The Time Machine, Shape of things to come. I found the idea of every person in the collective having to wear their feedback openly very amusing (a slippery slope from eBay perhaps?). What would your feedback say? What would happen if Thursday Next from The Eyre Affair jumped into the book Shades of Grey? Now there’s a mash-up I’d love to see! It won't happen. They are entirely separate. SoG happens in the 'Real' world and not the Nextian one. Mind you, I did reference one of my own books in SoG - sharp-eyed readers might be able to spot it! Ah, too bad! Why do you think dystopian fiction has such a following these days? What’s the attraction? Perhaps we are entering another cold-war type era, (Hot war era?) where apocalypse is once again alive in the zeitgeist. What will happen to us all? Will we get another chance? Can we get away from the whole 'killing one another' deal and do things better? Are book bloggers on your radar? Do you think they are relevant in today’s publishing environment? Hugely relevant. Blogging is very much another form of 'chatting on the bus' that publishers could never be party to. Only now the busses number several thousand, and many of them can carry upwards of half a million people on them. It's word-of-mouth Jim, but not as we know it. Personally, I try to stay away from reviews as even though 99 can be good, it's the one that's bad that I think about. On another note, book-blogging is a matter of great concern to publishers because they can't really 'test the water' as they could in the old days by reading the dozen or so broadsheet reviews, or even know where they shouold put their publicity budget. It's a testing time for publishers everywhere. Want more Jasper? Check out his fascinating thoughts on visualizing color at his website. Also, this "very British" interview at Hipster Book Club answered a lot of my questions about Jasper's world building and the color hierarchy in SHADES OF GREY. 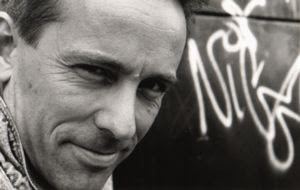 Photo credits: Jasper Fforde by Mari Fforde. UK Shades of Grey Cover. Megan interviewed me about Dystopian February at Po(sey) sessions and asked some really great questions. Check it out! 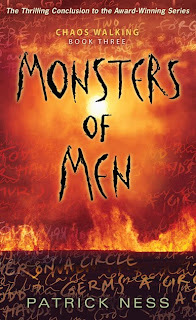 The US version of Patrick Ness' 3rd book in the Chaos Walking trilogy, MONSTERS OF MEN, got a cover this week too. It's due Sept 28th in the US (and May 3rd in the UK). 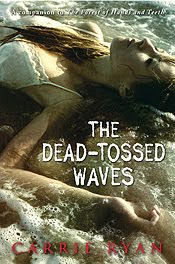 I also just pre-ordered my signed copy of Carrie Ryan's THE DEAD-TOSSED WAVES, companion to THE FOREST OF HANDS AND TEETH (read my review of TFOHAT) which comes out March 9th. You can read a teaser excerpt on Carrie's website. James Dashner's follow-up to THE MAZE RUNNER, called THE SCORCH TRIALS is set to drop October 12th. Megan from Po(sey) Sessions attended his reading of 2 chapters of TST at LTUE so if you really need a hint of where the series is going...ask her! Next Wednesday, I'll preview some more upcoming dystopian fiction - standalones or new series. If the idea of fantasy and science fiction is about holding up a mirror to real world issues, it helps if you can recreate the entire world of your story around that particular real-world issue. Do you want to talk about genetic engineering creating unfair class differences? Gattaca. Do you want to talk about ideals of beauty? Uglies. Privacy? 1984. Free will? Candor. Censorship? Farenheit 451. Third-world exploitation and getting desensitized to televised violence? The Hunger Games. Like a scientist, the author of a dystopian work of fiction creates a set of very particular conditions within which he runs his human experiment. And of course Publisher's Weekly's recent article - Apocalypse Now - about the popularity of YA dystopias is not to be missed. Oh wait, that's what they do anyway! Right now they are losing and we can't have that can we?! Because if they lose, they might be too sad to appear on the blog anymore. And that would be a real dystopian situation. Claudia lives in a future society that plays at living in the 17th century and where technology and anything “off-era” is forbidden. Her father is warden of an experimental prison closed off from the Outside called Incarceron. Trapped inside Incarceron is Finn, a teen sure he’s from the Outside and determined not only to prove it but to return there. My reading during Dystopian February has been amazingly varied so far, proving that dystopian fiction comes in many different forms. I’ve read some that have skewed sci-fi, literary fiction, horror, even slightly “comic”. INCARCERON skews high fantasy (a genre I tend to avoid) thanks to a whole fantasy world existing within Incarceron. Plot-wise, there is a lot going on here. We have Claudia on the Outside who is caught up in an assassination plot, preparing for her arranged wedding to the Queen's feckless son and discovering a device that lets her communicate with the Inside. Then we have Finn on the Inside who is on the run from his adopted clan and following the path of Sapphique, the only prisoner ever to leave the prison. He acquires a device that lets him communicate with the Outside (i.e Claudia). It turns out that people on the Outside think that Incarceron is a perfect world, an experimental utopia if you will. Well, we all know what happens to engineered utopias don’t we? As one of the prisoners writes in his diary, “…is it that man contains within himself the seeds of evil? That even if he is placed in a paradise perfectly formed for him he will poison it, slowly, with his own jealousies and desires? 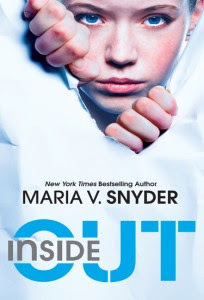 I fear it may be that we blame the Prison for our own corruption.” (p 320) When Claudia finds out how bad it really is Inside, she makes it her personal mission to free Finn. But is it really that much better on the Outside? I really enjoyed the philosophical questions the novel raised, the twisty plot, the interesting characters, and the world building of the Outside world (17th century to the naked eye, but with hidden washing machines – cool!). I was a little less keen on Incarceron itself. I liked that it was “alive” and its' all-seeing eyes (and the implications of that), but some of the scenes Inside kind of bored me because they were too high fantasy and too bogged down in description. INCARCERON was just released this month in hardcover in the US and is available in paperback in the UK. Find out more about it at the author’s website. PS. 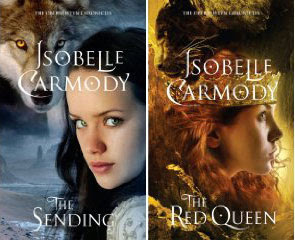 Come back on Wednesday when I will be reviewing the sequel SAPPHIQUE and will offer both books in an international giveway! In a dystopian (alternate? future?) England, gang violence has gotten so bad that the state has sanctioned a hellish underground prison for young felons dubbed the Furnace. Once a teen criminal has been sentenced there, it’s for life – with no chance of ever seeing the sun again. One inmate is 15 year old Alex Sawyer. Alex may be a thief and a bully, but he didn’t kill his best friend – he was framed. And his only hope for justice and redemption is escape from a place no one has ever escaped from. LOCKDOWN is very much a plot-driven action/horror spectacle aimed squarely at teen boys. You’re not going to find a lot of deep exploration of weighty themes here, but you are taken on quite the thrill ride as Alex navigates his way through his new hellish environment and plots his seemingly impossible escape. There are some very scary supernatural elements at work in the prison, and the main motivation to keep reading in spite of the nightmare-inducing setting is to discover just what the warden does with kids that are “taken” from their cells at night, never to return. And of course to hope that Alex and his buddies find a way out. Being that there are two more books in the ESCAPE FROM FURNACE trilogy, SOLITARY and DEATH SENTENCE (coming in 2010 and 2011 in the US, but already released in the UK), this first book definitely takes over the set-up role, and although there is a measure of closure, the story you came for (i.e. escaping) is most definitely not complete (must get sequels now!). Find out more about the trilogy on the author’s website. Also, read an interview with the author (where he mentions that dystopian classic 1984 and its "complex relationship between desperation and hope" was an influence on his work) at the publisher's website. Ann and Peter’s marriage is over, damaged slowly but irreparably by the loss of a child years before. Their two daughters aren’t taking their split well. Ann feels like friends are shutting her out. But now that a pandemic of H5N1 avian flu is threatening their very lives, Ann and Peter face much bigger problems. 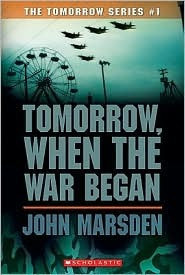 This apocalyptic novel hits most of the beats you expect it to, especially if you’ve read this type of “everyman vs large scale catastrophe” angle before (such as LIFE AS WE KNEW IT by Susan Beth Pfeffer or INTO THE FOREST by Jean Hegland). There’s the mass panic race to get food and supplies with shocking moments of human ugliness, the grim reality of modern conveniences dropping away one by one, and the inevitable specter of death close to home. The unique selling point for me as a reader was the fact that it is from a mother’s point of view, a mother that would do anything to keep her children safe – and believe me, this mother has to make some heartbreaking, impossible, horrifying choices. First-time novelist Buckley does some things amazingly well. The atmosphere she creates is pitch perfect, especially in the early chapters which are creepily foreboding. The narrative arc of Ann and Peter’s relationship is what holds the story together and it is both believable and touching. And there are quite a few memorable scenes that haunt you long after you read the last page (the one with a cough used as a weapon probably haunts me the most). The plot can stretch credibility a bit with dramatic highs and lows more suitable perhaps for one of those high octane TV disaster movies of the week. Ann and the family are hit with one crisis after another – it’s relentless. But when they do catch a break, their good luck often seems illogical within the framework of the story which can be jarring (I can’t name specifics without spoilers, but if you want to discuss this, e-mail me). There’s also the not-insignificant matter of the truncated climax and a very unexpected epilogue which switches to the first person perspective of one of the novels most criminally underdeveloped characters. On the one hand, the epilogue is a beautiful and emotional ending, but on the other, I kind of felt like it took the easy way out and left a lot of my questions unanswered. THE THINGS THAT KEEP US HERE was released this month in hardcover. Find out more about it at the author's website. P.S. I just have to mention that I adore this cover. I never thought a bird feather could be so scary!